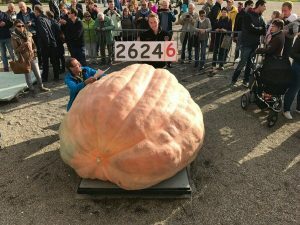 Let your students marvel at World Record winning giant pumpkins as they use proportions to calculate the quantities of pumpkin puree and the number of pumpkin pies that could be made from one of these giants. To introduce the task you might show this cool time lapse video of a giant pumpkin from planting to harvest. For our members we have an editable Word docx and solutions below. Check out & share this interesting article from TIME The Great Pumpkin Race.